Peace Pals, a photo by kpetra on Flickr. In general, I am not a big fan of knitting toys. But they are fun to play with. A month ago my LYS sent out a plea to help with making Peace Pals. 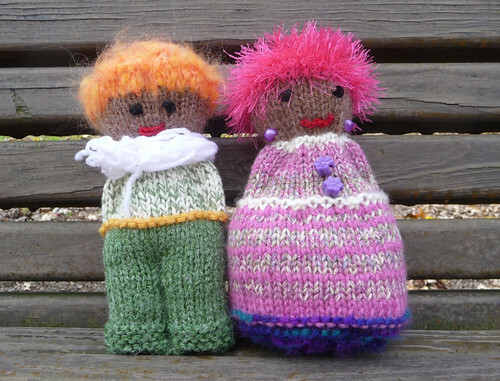 I found out more about the organization (women4women-knitting4peace) that sponsors these projects and really liked them. So, I knitted the boy. My older one decided he was cold and could use a scarf and immediately put her fingerknitting skills in good use. So, the boy was warm but he was still lonely. He needed a girl. I thought another 2 hours and we’ll call it a success. I was wrong. I did not realize how big the girl’s skirt was! But now she is done, they got married (that’s what my girls said) and were sent on a long journey. Along with many others, they will travel to an orphanage in Tanzania. The original pattern is knit flat. I don’t like seeming and knitted the girl in the round. It worked really well. More then a year ago, after patiently waiting in a long line and after fighting the crowds at The Sanguine Gryphon booth at Rhinebeck, I scored 4 skeins of hand-dyed Bugga. 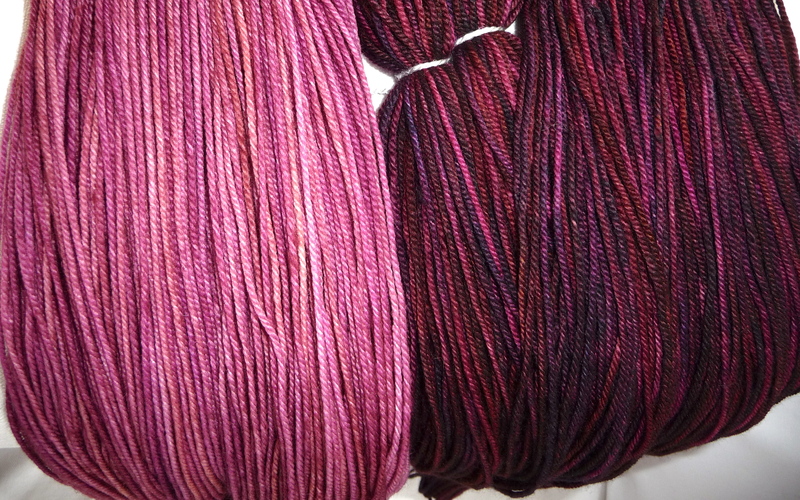 Shortly after my trip The Sanguine Gryphon ceased to exit, and split into Verdant Gryphon and Cephalopod Yarns. I went to Rhinebeck with a mission and knew exactly what and how much I wanted and what project I was going to make. And the saga of Bugga yarn has began. BTW, Bugga is still being produced by both of the companies. For those of you who were able to avoid the Bugga craze, it’s a beautiful blend of 70% SW Merino, 20% Cashmere, 10% Nylon in sport weight. I started working on the designated cardigan, knit most of the back and ripped it out. Was not happy. Started knitting again, this time in one piece, got all the way to the underarms and ripped out. Was not happy. At this point, my yarn was not happy with me either and curled all up. So, half of each skein I haven’t abused so far was perfectly straight, whereas the other half of the same skein was cutely curly. At this point, I finally figured out my original project was not working for me and found a different pattern. Yet, the yarn did not applaud my efforts and stayed curly. I considered several options. But since my frogged piece has never been washed, or steamed, I went with the least painful treatment. 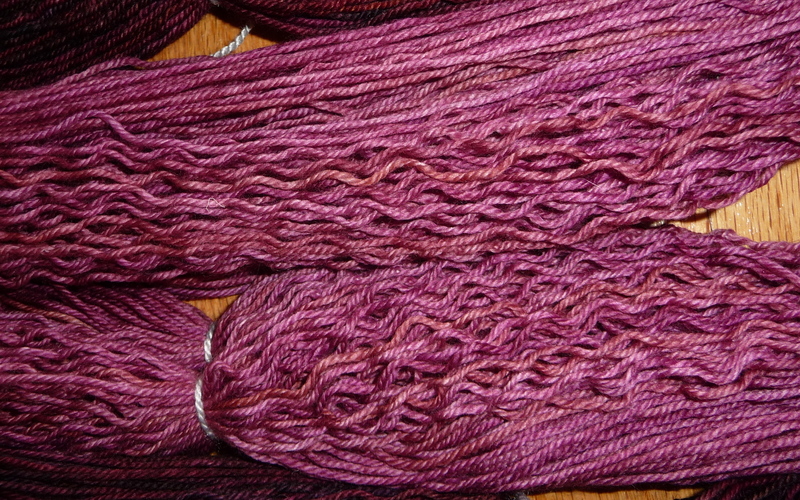 I skeined the yarns and gave them nice, long warm bath. I decided to trust wool’s natural tendency to return to its original state and hoped the bath will wash away all the curls without killing the yarn. To dry, I did not use any weights, did not stretch it. Just let it hang. And it worked! I effectively reclaimed my precious yarn and it’s being currently knit into a pullover.